^ Haneji N, Nakamura T, Takio K, Yanagi K, Higashiyama H, Saito I, Noji S, Sugino H, Hayashi Y. (April 1997). “Identification of alpha-fodrin as a candidate autoantigen in primary Sjögren's syndrome.”. Science: 604-607. doi:10.1126/science.276.5312.604. PMID 9110981. ^ Ishimaru N, Arakaki R, Yoshida S, Yamada A, Noji S, Hayashi Y. (November 2008). 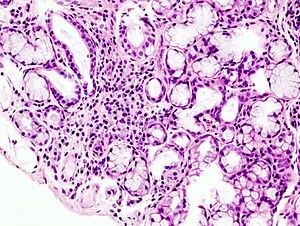 “Expression of the retinoblastoma protein RbAp48 in exocrine glands leads to Sjögren's syndrome-like autoimmune exocrinopathy”. The Journal of Experimental Medicine: 2915-2927. doi:10.1084/jem.20080174. PMID 19015307. ^ Inoue H, Mishima K, Yamamoto-Yoshida S, Ushikoshi-Nakayama R, Nakagawa Y, Yamamoto K, Ryo K, Ide F, Saito I. (May 2012). “Aryl hydrocarbon receptor-mediated induction of EBV reactivation as a risk factor for Sjogren's syndrome.”. Journal of immunology: 4654-4662. doi:10.4049/jimmunol.1101575. PMID 22467650. ^ Joo KW, Jeon US, Han JS, Ahn C, Kim S, Lee JS, Kim GH, Cho YS, Kim YH, Kim J (April 1998). “Absence of H(+)-ATPase in the intercalated cells of renal tissues in classic distal renal tubular acidosis”. Clinical nephrology 49 (4): 226-231. PMID 9582552.